In small and micro-enterprises, formal QM systems currently play only a minimal role in training. What is missing, for example, is practice-oriented knowledge about quality management, a corresponding attitude and suitable methods and instruments that can be applied in the actual core area of training, that is, the immediate interaction between trainers and trainees and their ability to communicate about matters of quality. The "Grassroots QDA" approach is focused on the stakeholders in initial and continuing education and training. Everybody has to train him/herself: Trainees must build their knowledge and skills themselves. The quality of vocational education and training processes in SMEs and educational establishments is generated to a significant extent through the cooperation of trainers and trainees (co-creation thesis): Even if education cannot be caused directly, it can be promoted through learning arrangements, learning climate and suitable challenges. The quality of this co-creation can be optimised if the philosophy of a continuous quality development in the spirit of the PDCA cycle ("Plan-Do-Check-Act") is successfully anchored in the stakeholders involved and if these stakeholders have easy-to-use, practical instruments and methods for decision-making, feedback, reflection, evaluation and practice research at their disposal which they can use directly in the training process to run through this cycle together over and over again. The teachers and learners will utilise the Grassroots QDA once they have experienced the effectiveness of such an integrated continuous QDA and are able to apply the respective instruments. For that purpose, they have to be open to experimentation and testing and gradually adapt the concept to their own needs. GAB Munich - Association for Research and Development in Vocational Training and Occupations is responsible for the project management of this pilot project. The AOK Education Centre Rhineland-Palatinate/Saarland and the Alanus Continuing Education Centre (AWH) develop and test the methodology and the procedure of a cooperative quality development and assurance. Three SMEs are integrated in the project to clarify the transferarbility ino the in-company practice. It is integrated into the training process. The stakeholders in training are also responsible for the QDA, which means that those who train and the trainees are primarily the ones who jointly develop and assure the quality of training. The stakeholders in training are supported through suitable framework conditions: a quality model, quality goals, a quality culture and the necessary resources provide the interactive and integrated QDA with an overall frame of reference. The ideas of interactive QDA are internalised by all stakeholders so that they recognize the value of their contributions to quality and therefore feel responsible for the QDA (quality culture). The stakeholders have a number of comprehensible, simple and immediately applicable QDA methods and instruments at their disposal, e.g. for describing and coordinating objectives, for assessing the current situation, for reflection, evaluation and practice research. Teachers and learners are thus enabled to cooperate and find out how well their ommon teaching/learning process works. With these Grassroots QDA components, the stakeholders acquire not only essential skills which also benefit their normal professional life, but also a general attitude of meeting the commnication partner, e.g. the customer, on an equal footing. Planning, interaction, coordination and cooperation between the stakeholders are effectively improved. A first transfer takes place through further developing the concept developed by the providers of vocational education and training and adapting it to the conditions in SMEs and to training at the workplace. The inter-company dissemination of the Grassroots QDA is already effected to some extent by integrating the concept during the trial phases into the preparatory courses for the AEVO examination and the further training programmes to become certified initial and continuing education and training educationist and certified vocational educationist: The participants become familiar with the Grassroots QDA in their own further education to become (future) trainers and can experience the utility themselves from a learner's perspective. Once the Grassroots QDA concept is fully developed, it will b integrated permanently into the courses referred to above. Other planned inter-company transfer measures are a counselling and further education opportunity for developing the training quality in SMEs designed by one of the partners (AWH), publications in the form of a reference book and articles in specialist journals and a symposium directed primarily towards education providers and training counsellors of the Chambers of Industry and Commerce who are interested in spreading the grassroots concept among other SMEs. 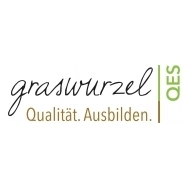 As a first step the Grassroots QDA was initially developed with two partners, Alanus Continuing Education Centre (AWH) and the AOK Education Centre Rhineland-Palatinate/Saarland. Forst of all, the framework conditions for the initial and continuing education and training offers of the respective institution were analysed and a quality model, quality goals and quality criteria were developed. Verifiable quality goals were derived which can be taken into account when palnning the teaching/learning processes. Subsequently, the achievement of these goals can be jointly controlled and reflected. The quality model, the concrete quality criteria and the QDA instruments were tested before starting with their transfer to the SMEs. In the spirit of practice research, the question is asked of how the quality goals can now be pursued and reached in the teacher/learner interaction as efficiently as possible. A second trial run takes up the insights and conclusions from the first trial phase in the sense of continuous improvement and potimises the practically effective Grassroots QDA. In parallel to the second trial run, the Grassroots QDA concept is further developed for training situations at the workplace. For this purpose it is transferred to the practical technical training in the individual AOK RRhineland-Palatinate offices and to at least three SMEs. The fact that the SMEs will have very little time available for such "extra-curricular activities" that are (initially) not productive is taken into account. to impart the required skills. The experiences gained are evaluated and form the basis for further optimisation of the concept. 1. A tested and functioning concept for QDA integrated into initial training that takes the requirements of SMEs and vocational education and training institutions into account. 2. A concept for the qualification and counselling of vocational education providers and their training staff and of owners and skilled workers in charge of training in SMEs. 3. The integration of Grassroots QDA into the further education and training opportunities offered by the participating providers - the preparatory courses for the AEVO examination, the further training programmes to become certified initial and continuing education and training educationist and certified vocational educationst. 4. The acceptance and implemantation of Grassroots QDA by the graduates of these further education and training programmes in their companies. Click here for detailed project description (in german language).